1. Open the "Mail" application in your list of all programs. Once it's open click the "Settings" option. Usually there is a button on the bottom of the android screen that does this. Next, click "New account" and you will see the screen to the left. Choose "Other." 2. Click on "Protocol" and choose the type of account you are setting up. This will usually be "IMAP." 3. 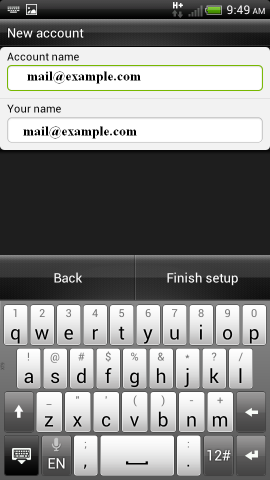 Add the email address and password and click "manual setup"
4. Add your incoming mail settings. This will be your full email address, your username which is also your full email address, and your password. 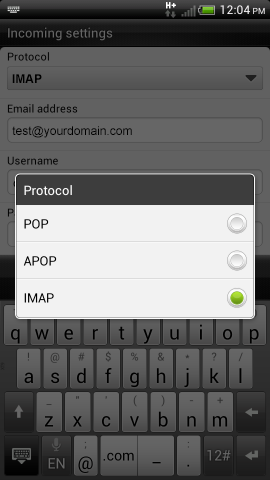 Your IMAP or POP server will be mail.yourdomain.com. "Security type" will be SSL and the Server port should be 993. 5. Your outgoing settings will essentially be the same as your incoming settings. Make sure you click "Login required" on the top. 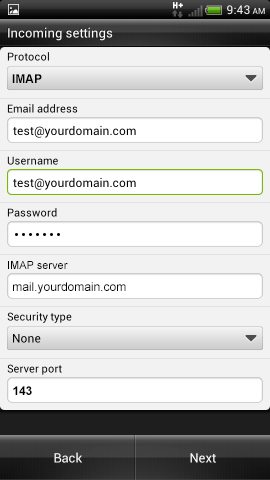 Make sure your SMTP server is mail.yourdomain.com. "Security type" should be "SSL" and the "Server port" should be changed to 465. 6. The "Account name" field will be what the account is called on your phone. The "Your name" field is what people will see on your messages when you send them. Click "Finish setup" and your done. Note: Keep in mind that android has many mail programs available to it. K9 mail is one example of an alternate option to the default mail program. These steps can be followed, generally, to set up all of them. If you get stuck remember the options button, not shown on most screenshots, will get you started.